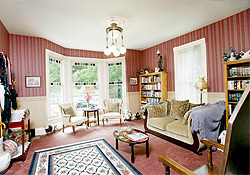 Southern hospitality combined with Victorian charm await you at our beautiful Queen Anne/Eastlake home! 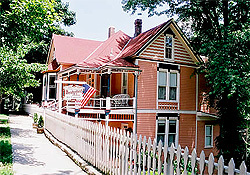 1884 Bridgeford House is nestled in the very heart of Eureka Springs. We consider our quiet neighborhood to be the very best location in town! Our Eureka Springs bed and breakfast is within a few blocks of the downtown stores - a very easy stroll past antique shops, massage spas, art emporiums and fine restaurants. Our Arkansas bed and breakfast provides a view of the beautiful vistas of the surrounding mountains and our famous springs. 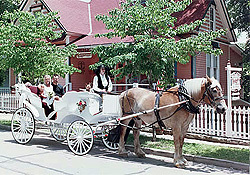 We are on the trolley car and the horse drawn carriage routes as well. This "Painted Lady" is listed on the National Register of Historic places. Our "Secret Garden" has been honored with Eureka Springs Garden Club's Award for "Garden of the Season." You will immediately feel at ease with the smiling faces, kind words & Southern hospitality of our Eureka Springs bed and breakfast. Complimentary cinnamon scones or other treats await you in your room. Any special arrangements you desire such as champagne, extra flowers, etc. can be requested at our Arkansas bed and breakfast. 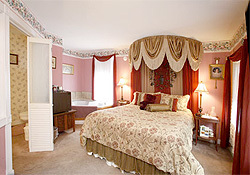 If you desire, a romantic sojourn, chocolates, show reservations, massages, etc. can be requested. Preheat oven to 400 degrees. Divide strawberries evenly into 4 small greased ramekins. Sprinkle with liqueur. Place ramekins on baking sheet. Whip cream to soft mounds; add egg yolk, powdered sugar and vanilla and continue beating 1 minute. Spoon mixture over strawberries. Bake 3 minutes. Place under broiler for about 1 minute or until tops are lightly browned (watch carefully). Serve immediately.